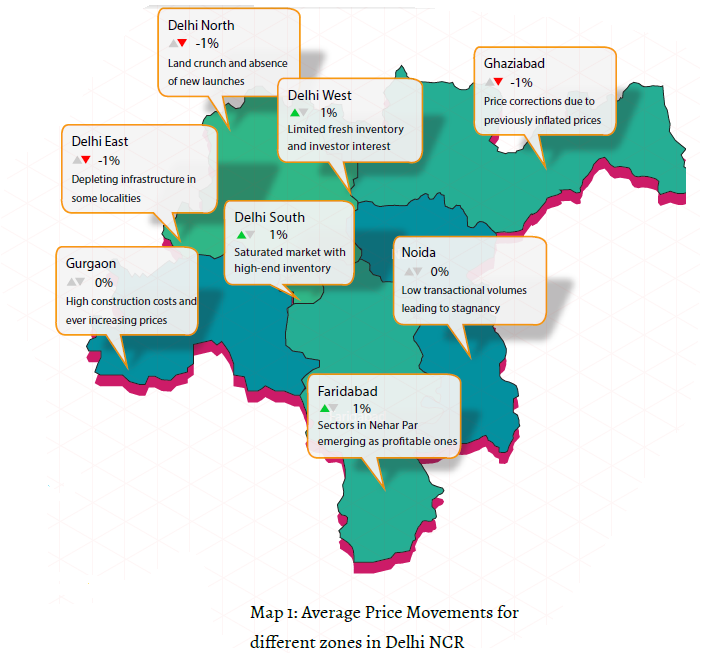 The National Capital Region (NCR) mostly witnessed degrowth or stagnation in prices of residential apartments in the Jul-Sep 2014 quarter in almost all regions with the exception of Delhi South, West and micro-markets of Greater Noida and Gurgaon. Proposed infrastructure developments around the city have barely impacted capital values. The market is yet to shrug off its two year old inertia with investors still playing defensive. 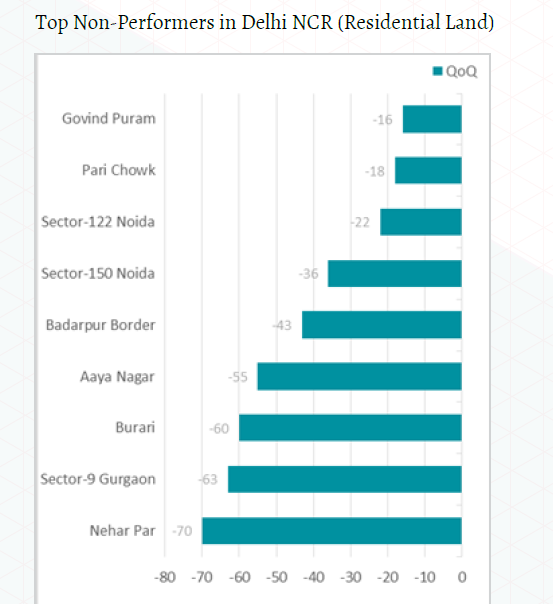 Sector 31 in Gurgaon was the frontrunner with an appreciation of 26 per cent in the Jul-Sep 2014 quarter followed by Sector Omicron 1 in Greater Noida where prices jumped by 22 per cent and Greater Kailash II in South Delhi that went up by 14 per cent. The newly developed Aaya Nagar, located close to the Gurgaon border, added significantly to the supply of apartments in the region and witnessed a six per cent capital growth. For most other localities in Delhi NCR, prices either fell or remained static, signaling decreased demand from both end users and investors. Even hitherto investor hotspots such as Bhiwadi and Dharuhera seemed to be losing their charm, keeping in line with the overall reticent realty atmosphere in NCR. Gurgaon in particular is reeling under pressure of high construction costs and unsold inventory, especially in the luxury housing segment and did not see any average capital value growth. Localities that have performed well here in comparison to the previous quarter include Sector 41 (South City 1) and Sector 68 that are close to IIFCO Chowk metro station and Sohna-Gurgaon road, respectively. In Ghaziabad, despite the presence of growth drivers such as metro and proximity to NH 24 and Anand Vihar ISBT, some popular trans-Hindon localities such as Kaushambi, Vaishali and Vasundhara fell down on the Return on Investments (ROI) scale by three, six and 10 per cent, respectively, due to price corrections and civic issues like frequent power cuts. The two national highways crossing Ghaziabad, NH-91 and NH-58 witnessed a jump of almost nine per cent each in the prices of residential apartments mainly due to key policy announcements including better connectivity with NH-24 for localities falling on NH-58 and affordable housing options on NH-91. In Greater Noida, the announcement of a new metro link between Noida and Greater Noida impacted Pari Chowk and Knowledge Park III that saw a price rise of three per cent and 11 per cent, respectively. Residential property values in Sector Omicron I also appreciated by 22 per cent due to increase in occupancy levels post possession of major projects. Prices of residential apartments in Noida Extension, however, continued to be flat due to oversupply of inventory and decreased sales. No substantial price appreciation is expected here before the commencement of metro work in 2017. “Greater Noida and some localities of Ghaziabad emerged as new favourites with capital value growth to the tune of 22% and 10% respectively." Residential Land Analysis Limited land banks within Delhi have unlocked value in peripheral areas that are now becoming a popular choice for end users and investors. 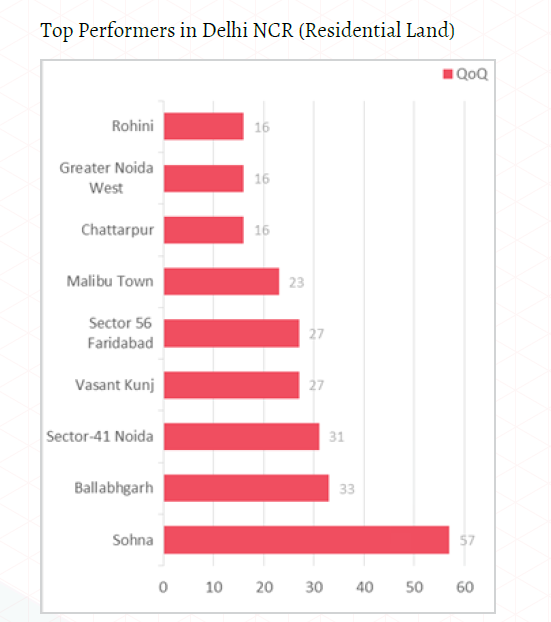 Areas such as Sohna, on the fringes of Gurgaon and Ballabhgarh in Faridabad recorded highest capital appreciation in residential land in the Jul-Sep 2014 quarter as against the previous one. With a 57 per cent jump, land prices in Sohna have soared to Rs 6,500–Rs 35,100 per sq yard in Jul-Sep this year. The sub city began evolving as an investment destination after the announcement of Sohna Master Plan-2031 last year, which notified 6110 hectares in 38 sectors for residential development. Easy connectivity to Delhi and Faridabad and the announcement of industrial model town IMT-Sohna are seen as major growth drivers here. Ballabhgarh in Faridabad also performed well on the ROI scale and land prices rose by 33 per cent in the last quarter. Just one hour from Connaught Place, Ballabhgarh lies on Mathura road and has huge parcels of residential land. 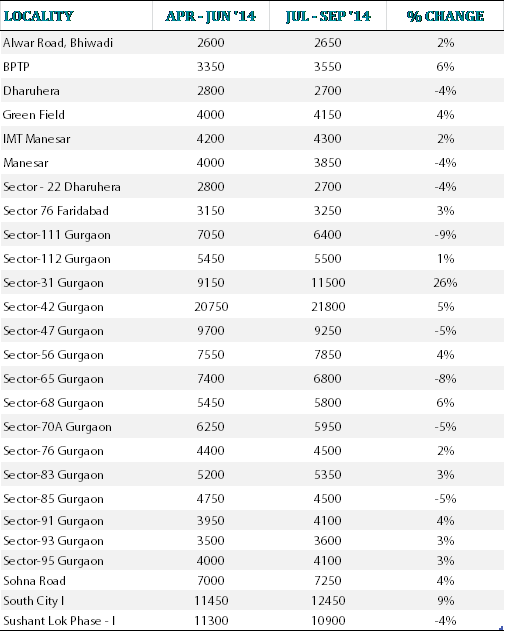 Other localities that witnessed price appreciation include Sector 41-Noida, Vasant Kunj and Sector 56-Faridabad. Price appreciation is attributable to increase in ‘ask’ prices by sellers, as well as proximity to industrial pockets, especially in the case of sectors situated in Faridabad. Localities that saw a fall in the prices of residential land include Nehar Par that depreciated by 70 per cent owing to the increasing demand for apartments and builder floors in the area in comparison to land pockets. Aaya Nagar in South Delhi, one of the top gainers in capital value growth of residential apartments, witnessed a 55 per cent fall in the prices of residential land due to increasing demand for ready-to-move in options. Weak investor sentiments in case of residential land can be attributed to price depreciation in most localities including Sector 9-Gurgaon and Badarpur. Chattarpur, one of the most popular areas in Delhi for farm houses, never slackens when it comes to demand for residential land. Increasing demand has led to a price hike of 16 per cent in Jul-Sep 2014 quarter as compared to the previous one. Approval of Greater Noida Master Plan 2021 and proposed infra developments such as metro link between Noida and Greater Noida helped the area earn a 16 per cent price-hike in the last quarter. DELHI NCR > North, East, West, South and Dwarka With limited stock of fresh inventory in Delhi, the property market has entered a phase where capital values are static. Investors are looking for newer avenues along the city’s periphery. Localities that have shown upward movement include Pitampura and Uttam Nagar in North-West Delhi and Greater Kailash and Saket in South Delhi. These areas largely dependent on secondary market transactions. Pitampura and Uttam Nagar in North-West Delhi witnessed a capital appreciation of seven per cent each in the Jul- Sep quarter as against Apr-Jun 2014. Both these areas predominantly witness secondary market transactions. Despite reaching a saturation point, capital growth in the last quarter can be credited to high demand in areas close to the metro that have co-existing commercial and residential pockets. Increase in housing prices could simply be due to an increase in the ‘ask’ prices by sellers. 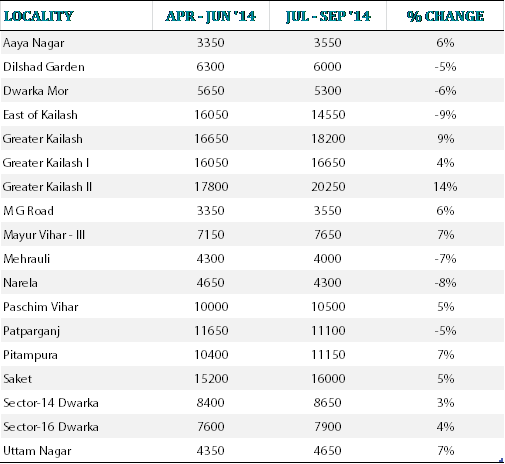 Paschim Vihar in West Delhi saw a five per cent jump in property prices last quarter. With no further scope of new projects because of unavailability of land, this area mostly consists of builder floors and Delhi Development Authority (DDA ) apartments and is divided into various sectors. Self-sufficient with respect to social infra including markets, hospitals, schools and other civic amenities, growth can be attributed to more optimistic valuations. Poor connectivity and infrastructure is preventing Narela from growing as a real estate pocket. Largely consisting of industries and colleges, some DDA housing schemes were launched here in the past, however, occupancy levels are still on the lower side. The area saw a dip of eight per cent in last quarter, thus continuing the uneven price trend pattern that it has been witnessing for the last two years. Prices of residential apartments fell in some other areas in North-West Delhi such as Burari, Rohini and Janakpuri by two, four and four per cent, respectively. While Janakpuri and Rohini are saturated markets, Burari suffered due to deteriorating law and order situation, drainage and waste management issues. Located close to Noida border, Mayur Vihar phase III has been climbing the growth ladder for the last two quarters with prices of residential properties increasing by almost seven per cent in Jul-Sep. The area largely consists of DDA flats categorized as LIG, HIG and Janta flats. The growth can be attributed to it being more affordable than the adjoining phases - Mayur Vihar I and II. 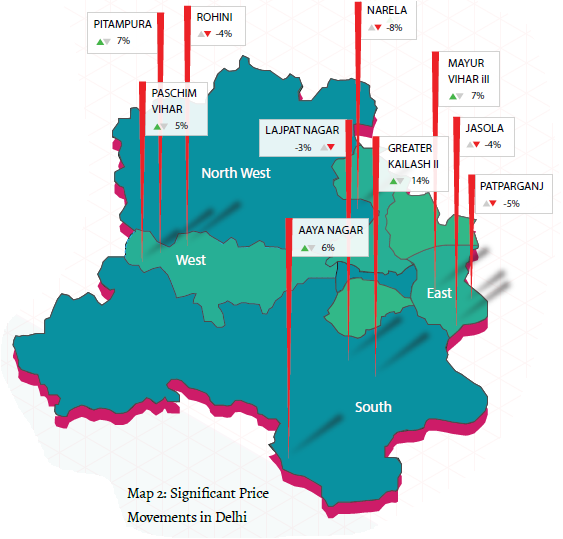 Patparganj and IP Extension in East Delhi have seen a drop of four per cent and one per cent, espectively, in the prices of residential property in the last quarter due to availability of more affordable investment and end use options opening up in Ghaziabad, which is just a few km from these two localities. Both primary and resale markets in South Delhi have witnessed declining sales because of multiple increases in the circle rates in the past few months. Hence, property prices in East of Kailash, Jasola and Lajpat have fallen down by nine, four and three per cent, respectively. Greater Kailash II has been the frontrunner in Delhi with 14 per cent capital growth. Of late, construction of independent floors and flats within bungalows has also become common. Ever improving infrastructure, presence of luxury malls and entertainment zones and high quality civic amenities are the major growth stimulators here. A newly developing colony, Aaya Nagar, has also performed well on the ROI scale in the last quarter by registering a growth of six per cent. The colony has a metro station of its own–Arjan Garh and is witnessing a lot of civic reforms in terms of better service roads and drainage management, which were earlier blocking its growth. While sectors 16, 14 and 4 in Dwarka grew by two per cent to four per cent, others like Dwarka Mor, Sectors 11, 13 and 10 saw a fall in property prices by two per cent to six per cent without any clear reason. The rental markets of Saket, Alaknanda and Malviya Nagar in South Delhi, Vasundhara Enclave in East Delhi and Sectors 2, 3, 5, 7, 10 and 12 in Dwarka sub-city saw decent traction this year versus the previous year (Jul-Sep 2013 as against Jul-Sep 2014). The uptrend in rental rates in Dwarka can be attributed to the presence of 10 metro stations, the maximum in any micro-market in Delhi, and availability of more affordable rental options in comparison to most of the established localities in Delhi. A 1,200 sq ft apartment that used to cost Rs 13,200 per month in Dwarka last year is now available for Rs 14,400 per month. This translates into a growth of nine per cent annually. Rising demand for rental properties in Saket resulted in an increase in rental of 32 per cent, the maximum recorded in the entire Delhi NCR region. This means that a 1,200 sq ft apartment that used to cost Rs 26,400 per month in Saket last year is now available for Rs 34,800 per month. The locality has a metro station of its own that is the last underground station of Delhi Metro’s Yellow Line. DELHI NCR > Noida, Greater Noida and Ghaziabad The realty atmosphere in Noida, Greater Noida and Ghaziabad has been rewarding for some localities and disappointing for others. 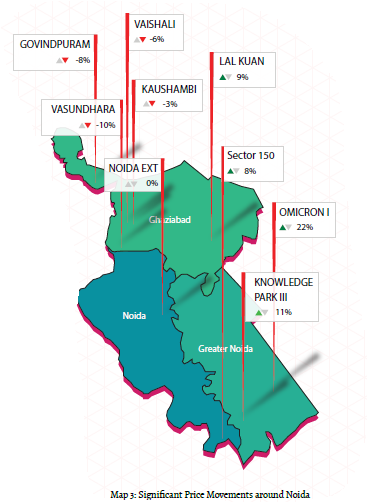 Sector Omicron 1 and Knowledge Park III in Greater Noida witnessed capital appreciation in double digits, whereas property prices in Vaishali and Vasundhara in Ghaziabad dropped substantially. 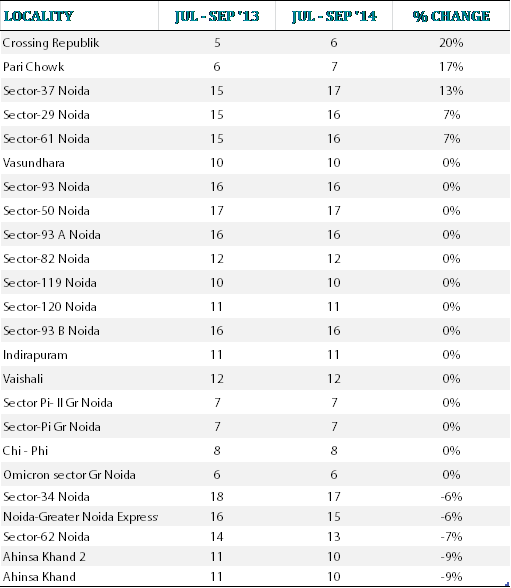 Sectors on the high interest Noida-Greater Noida Expressway continued to plateau. Sector Omicron 1, located near the Honda factory in Greater Noida, witnessed a quarter-on-quarter appreciation of 22 per cent due to rising occupancy levels since many projects are approaching maturity and builders have started offering possessions. For investors, this sector is a safe play due to absence of land acquisition related controversies plaguing other regions. Pari Chowk, Chi-Phi Sector and Knowledge Park III in Greater Noida witnessed capital growth of three per cent, six per cent and 11 per cent respectively owing to the final approval of the metro link between Noida and Greater Noida from the Ministry of Urban Development in April 2014. These localities have found a place on the Metro map. Improved connectivity is likely to push up prices further. Another sector buoyant on account of improved connectivity is Sector 150, Noida that has notched up eight per cent in the last quarter owing to the proposed inter-state bus terminal and FNG corridor. Prices of residential property in Lal Kuan, considered an affordable locality have jumped by nine per cent in the last quarter. The locality’s proximity to NH-24 and proposed metro line are seen as growth stimulators. Also appreciating by nine per cent is the National Highway 91 that has been on a growth trajectory post the announcement of the proposed Northern Peripheral road connecting NH-24 with North Delhi. This is expected to boost industrial growth around NH-91, thereby impacting housing demand from middle and lower income groups. Emerging residential localities on NH-91 include Gautam Budh Nagar, Vayu Enclave, Kudikhera Road and Chhapraula. The prices of residential apartments built along National Highway 58 have gone up by almost eight per cent due to proposed connectivity with NH-24 and extension of Delhi metro. Affordable housing options along adjoining Raj Nagar Extension have also contributed to this. Prominent trans-Hindon localities in Ghaziabad like Vaishali and Vasundhara witnessed a degrowth of six and 10 cent respectively due to demand shifting to adjoining areas of Noida that have a fresh supply of ready to move in apartments in the same price range. Indirapuram and Kaushambi have also been impacted for the same reason. Sector 110 in Noida largely comprises of Lotus Panache and some unauthorized establishments in the adjoining village, Bhangel. Reduced sales volumes of the project have brought overall prices down by nine per cent. Capital rates in Govind Puram, Ghaziabad continued a two year decline owing to poor infrastructure and civic amenities, limited inventory rom known builders and rapid unplanned construction. The 21-km stretch of NH-24 from UP ate to Dasna has been a commuter’s nightmare. However, the proposed road widening of this highway from the present eight lanes to 14 lanes is still awaiting commencement and this has adversely impacted prices in the last quarter. Prices of residential establishments along the stretch have fallen by four per cent. With as many as 150 under construction projects offering over 2.5 lakh housing units, Noida Extension or Greater Noida West is facing a problem of over-supply and insufficient sales volumes. This has been keeping the prices of residential apartments here stagnant at Rs 3,200 per sq ft for over a year now. With huge land parcels available for residential and commercial establishments, Yamuna Expressway is evolving as a long term investment destination and gradually reaping benefits with a quarter-on-quarter appreciation of two per cent. Delhi Mumbai Industrial Corridor (DMIC) that will pass through Dadri is expected to boost realty growth here. Being India’s longest six-lane controlled-access expressway stretch, it has attracted a lot of builders as well as investors. Sector 44 in Noida suffered on account of tough competition from neighbouring sectors that are offering ready to move inventory at a lower rate. 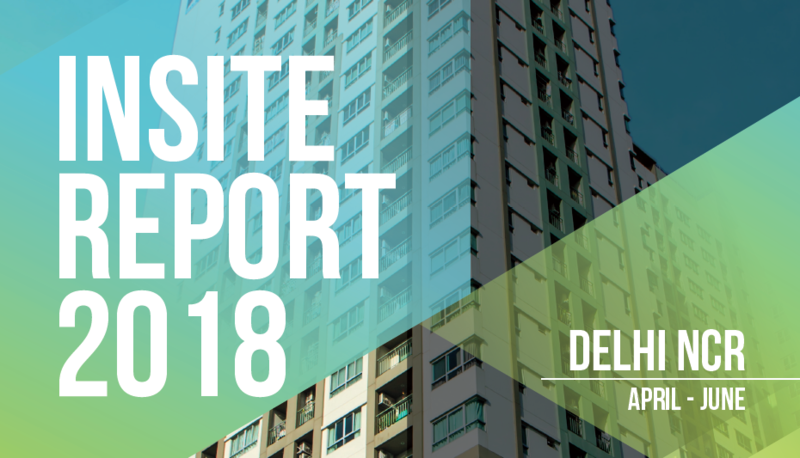 Most projects in Sector 44 Noida are priced around Rs 11,350 per sq ft whereas adjoining sectors (104, 45, 96) have options in the range of Rs 7,000–Rs 9000 per sq ft.
Sectors 93, 96, 97, 98, 100, 110 and 126 to 131 and further till Sector 151, aligned with the Noida-Greater Noida Expressway, are the emerging residential sectors along this stretch. Prices of residential apartments on this belt have remained stable for almost a year and continue to plateau due to delayed possession of major projects, low occupancy levels and absence of public transportation. Crossing Republik in Ghaziabad has consistently grown as an end user destination in Ghaziabad due to proximity to NH-24 and Noida and availability of affordable ready-to-move- in options in comparison to the popular trans-Hindon localities. This quarter, however, saw only one per cent hike in the prices of apartments due to absence of any fresh launches. Noida: Proximity to Botanical Garden metro station favored rentals in Sector 37-Noida impacting a 17 per cent annual increase. Located at a walking distance from both the popular Atta Market in Noida and Botanical Garden Metro Station, Sector 29 has plenty of options for paying guest accommodations Rental rates have here, thus, jumped by seven per cent in the last quarter. Sectors located on Noida-Greater Noida Expressway saw a fall in rental prices due to various reasons ranging from low occupancy levels to absence of public transportation. Greater Noida: Pari Chowk in Greater Noida witnessed a 17 per cent upsurge in the rentals from Rs 7,200 per month to Rs 8,400 per month for a 1,200 sq ft apartment probably owing to a newly announced metro link between Noida and Greater Noida by the Ministry of Urban Development this April. Rental rates for other sectors remained constant in the past one year. 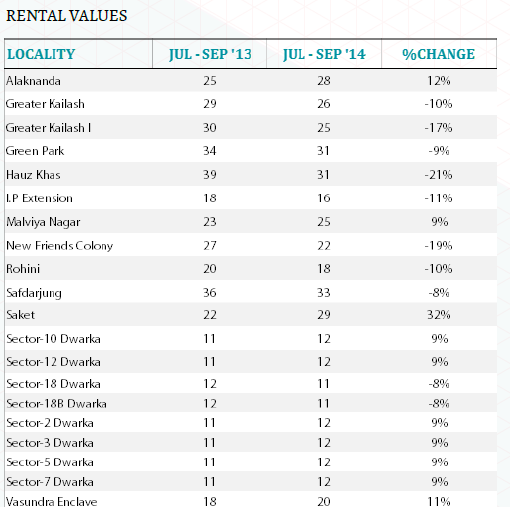 Ghaziabad: Year-on-year comparison of prices reveal that Crossing Republik is the most preferred destination for rent with an increase of 20 per cent. While one could get a 1,200 sq ft apartment on rent here for Rs 6,000 per month in Jul-Sep 2013, the same apartment would now be available for Rs 7,200 per month. Some hitherto popular sectors in Indirapuram–Ahinsa Khand and Ahinsa Khand 2 saw a fall in rentals probably owing to more affordable rental options in Crossing Republik, Raj Nagar Extension and Siddharth Vihar. DELHI NCR > Gurgaon, Bhiwadi, Dharuhera and Faridabad The Gurgaon real estate market has always been highly investor driven. Due to ever-increasing prices of residential property and emergence of peripheral areas such as Bhiwadi and Dharuhera, investors have started to shift focus to sub-markets. Despite this, residential apartment rates in Gurgaon are likely to trot up due to inflating construction costs and proposed infrastructure developments such as 37 new power substations. 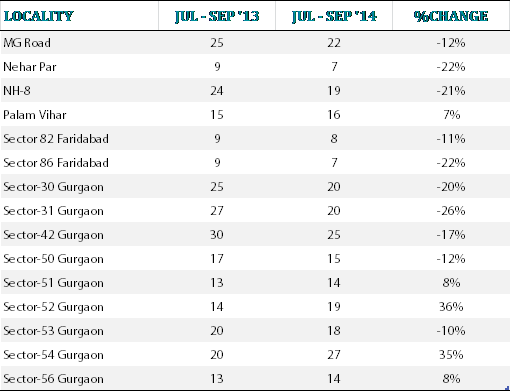 The top gainers in Gurgaon for the quarter ending September include Sector 31, South City 1 and Sector 68. Proximity to Huda City Centre metro station worked in favor of Sector 31, whereas Sector 68 saw a capital appreciation worth seven per cent owing to its strategic location on Sohna-Gurgaon road. South City 1 in Sector 41 also witnessed a healthy capital return of nine per cent owing to its contiguity with Delhi-Gurgaon Expressway and IIFCO Chowk metro station. All these areas have been on a growth trajectory for over a year now due to infrastructural developments and improved connectivity links. Some localities that were on a growth radar for a long while, such as Manesar, are either plateauing or facing degrowth due to competition from adjoining zones or price corrections on account of previously inflated prices and saturation in the property market. Despite industrial and commercial growth and many key policy announcements for residential establishments in Manesar by the Haryana Government, the town has witnessed over eight per cent fall in the prices of residential apartments in the last one year (comparing Jul-Sep ‘13 as against Jul-Sep ‘14). In this quarter, prices fell by almost four per cent. This could be attributed to the land acquisition row between farmers, builders and the Haryana Government. Additionally, civic issues such as lack of arterial roads and erratic power supply have seen rather slow solutions. Property prices in Dharuhera have been unpredictable in the last one year and the last quarter saw a fall of over five per cent. The town lacks adequate drainage facilities and does not have markets, malls and other entertainment zones of its own. Slow infrastructural reforms are keeping end users edgy. Bhiwadi was witnessing healthy demand from buyers and investors for some time. It has however entered a stagnation phase in the last quarter. Market demand in Bhiwadi is largely driven by local and neighboring regions such as Manesar, Gurgaon and other parts of Delhi NCR because residential units in this belt are still affordable. But due to overall slump in the market, prices fell flat in this industrial town. Residential zones along Sohna Road are giving decent returns on investment mainly due to a separate Sohna Master Plan-2031 that was notified in 2013. The belt also benefits from good connectivity with the prime locations of Gurgaon, Delhi and Faridabad. The stretch is expected to cater to the spill-over demand from Gurgaon and gain from infrastructural developments such as the proposed establishment of IMT Sohna and Ascendas IT SEZ. 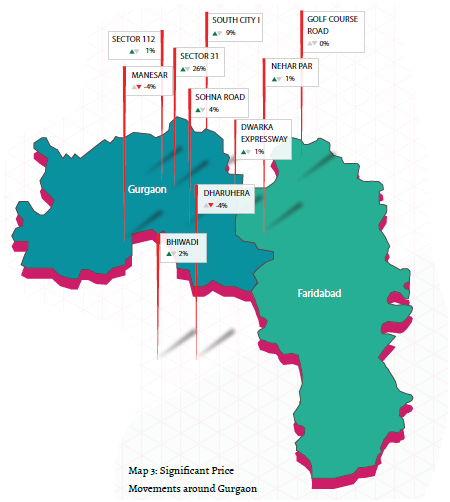 Sectors that have performed well in Faridabad this quarter include those close to Delhi and the main bypass road such as Sectors-76, 77 and 87. All these fall under the Nehar Par area. Major policy announcements including the upcoming Faridabad-Noida-Gurgaon Expressway, Eastern Peripheral Road and Western Peripheral Road improving Faridabad’s connectivity to other regions in NCR, are seen as growth stimulators. Capital appreciation in these sectors can be attributed to the extension of Delhi Metro from Badarpur to YMCA Chowk that is expected to get operational soon. For most other sectors in Faridabad, prices of residential property have remained unchanged due to slow pace of inventory take off. The rental markets of the Gurgaon and neighbouring satellite cities like Bhiwadi and Dharuhera have witnessed decent traction on account of huge demand from working population in Gurgaon. Presence of a number of office complexes in and around Palam Vihar keeps the rental market profitable. Sector 51 and 54 in Gurgaon are close to a number of educational institutes and colleges like IILM, G D Goenka World Institute, Ch. Partap Singh Memorial College of Education and others, keeping the influx of students and demand for rental spaces high. Delhi NCR is fast emerging as the major hub of real estate projects. The time seems ripe to invest in a property to get maximum capital appreciation over the years. Is the Real Estate market finally looking up?